Please indulge me as I go on a little rant. Ever since accusations of sexual misconduct began to surface involving Hollywood producer, Harvey Weinstein, accusations from various other women have surfaced left and right. You can’t login onto social media or turn on the news without hearing about someone else coming forward. Don’t get me wrong, I am not blaming these women, but rather I am embarrassed for men in general. This is not right and we, men, need to step up and do something. We need to say something and raise the bar for the next generation. There is something definitely missing in people to cause them to think that it is okay to treat people as just sexual objects to satisfy one’s own desires. I am not saying I am a model man; “Look at me and see perfection”, but something needs to change in this culture. Something has to give. Treating people as something less than what God created them to be is a sin. God created men AND women in His own image; both equally precious in His sight. Men and women are both equally loved and loveable. They are created for a purpose but not for the purpose of being abused or harassed or treated as an object. I imagine God, the Father, being saddened to see His daughters (women) treated like this. For men to treat women like an object is to disobey the creational purpose of God. God created men and women and then brought them together in marriage. Through marriage, God is putting the relationship of Christ (bridegroom) and the Church (bride) on display. Ephesians 5 says, Husbands, love your wives, as Christ loved the church and gave himself up for her, that he might sanctify her, having cleansed her by the washing of water with the word, so that he might present the church to himself in splendor, without spot or wrinkle or any such thing, that she might be holy and without blemish. In the same way husbands should love their wives as their own bodies. He who loves his wife loves himself. Sexual abuse and harassment of women is so contrary to God’s purpose for men and women. Godly men ought to be angered and offended to see and hear other men acting so immature and irresponsibly. Godly men need to stand up and say, “No more!” Godly men need to be shaken to the core and be determined, more than ever, to be godly examples to our sons and to the rest of this world. Godly men need to teach our daughters what it looks like to be treated with respect. Godly men need to take the reins and write a new narrative for our culture; that harassment and abuse of women is no longer welcomed. Men, let’s be the men God created us to be and glorify God through our example. Let’s take back our godly roles. Rant done. All praise be to God. Amen. as sheep without a shepherd. Oh, how I wish people would see Jesus. Oh, how I wish people would see their destructive path. Oh, how I wish people would repent and live. a world hell-bent on destroying themselves. And as I weep I also fear. I fear for my own children. I fear for my family. I fear for how I will respond. grant me Your Spirit that I may be strong. that only You can give. (which is the word of God). 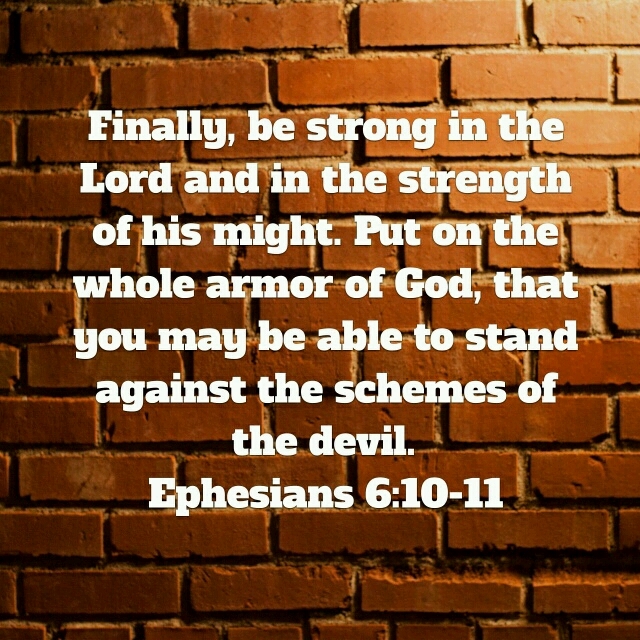 May this armor be my strength. but rather may I go forth into battle with your armor. with all love and grace. And in the end, may You be glorified. Be my strength and hope. Be my peace and salvation. I claim no expertise in parenting but rather, I claim a strong desire and passion to raise my children to know and love God through Jesus Christ. And that is why I am so drawn to the above verse. I am constantly thinking about ways to be a good example but also thinking about what my children are seeing in me. Children are going to learn about God from their parents. Hopefully they learn a lot at Sunday school and Bible camp and vacation Bible school, but children will learn about loving and living with God by watching their parents. But not just parents. Church, be mindful. The children are watching you too. Whether you have children or not, they are watching you. When you are in worship; children are watching you. When you are interacting with others; children are watching you. Whether you like it or not you are being recorded by a child’s built in video camera in their brains, so be mindful. But one of the biggest misconceptions in parenting is that as parents we need to be their child’s “best friend”. Children don’t need that. They have plenty of people to be best friends with. According to scripture, children need parents that will discipline them and teach them to know the Lord. Don’t get me wrong, I don’t share this verse in order to advocate beating your child. 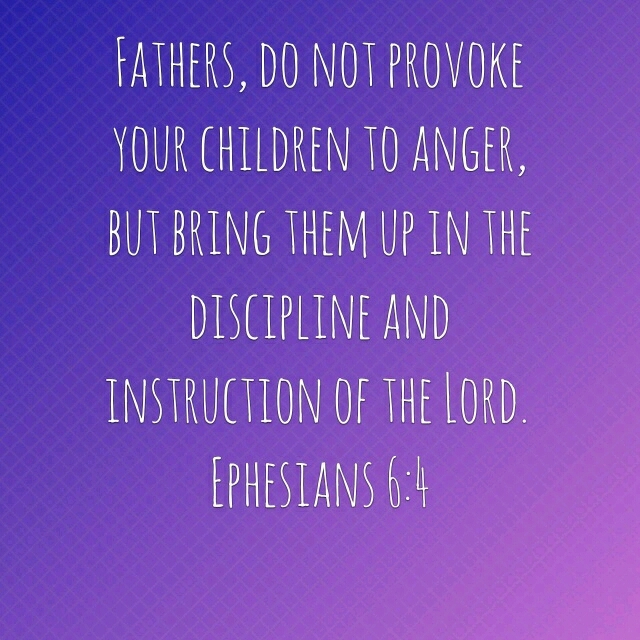 This verse is about a parent’s God-given responsibility to discipline a child when they go astray. How a child is to be disciplined is something for another blog post. But here, parents are not called to be best friends. Parents are called to raise their children to walk the narrow path; disciplining their children out of love not anger. And a parent may actually do this but see their child stray from the faith. If this happens, be patient, you have planted a seed. So don’t lose heart. Keep training them in the way they should go. How this training goes will vary from parent to parent but the common thread is, don’t be their best friend, be a faithful example of the Christian life. Love your children but even more than that, love God. The best thing a parent can do for their child(ren) is to love God more than them. I met with a couple last night who are preparing for marriage. Wow! What an awesome privilege to walk along side a man and a woman as they get ready to proclaim the Gospel through their marriage, but also scary. I say scary because marriage is an awesome calling from God, not a right. It is also an awesome responsibility. Marriage is about putting Christ’s relationship with the Church on display. Marriage is about showing what forgiveness looks like; what God’s love looks like (among many other things). And I get to help couples see this. If only we could grasp this “profound mystery” (Ephesians 5:32) we would all fall on our faces before God, begging for forgiveness, for how we have messed up and watered down marriage. So God help me as I walk with this couple. I don’t want to mess this up. But more importantly, I want to be faithful to scripture; I want to be faithful to your promises and commands. So I ask all of you to be in prayer about marriage. Pray for men and women who are married. Pray for those preparing for marriage. Pray for those who are single that they may honor marriage through their calling to be single. Pray for those in struggling marriages that they may find healing in some way. Pray for those who are divorced that they may be made whole through Jesus Christ. Pray for marriage. Pray for marriage with all your being. And then pray some more. If you have time, pray for me as I work with couples. May I be faithful and bold and loving and compassionate. And may I glorify God. And may YOU glorify God as well. ~ Grace; free gift from God. ~ Salvation is this free gift through faith in Jesus. ~ We don’t (and can’t do this) and praise be to God for that; for we couldn’t depend on our choice. ~ And in case you forgot, this is a free gift. ~ And again, in case you forgot, this is not the results of your works. ~ Therefore, do not brag but rather worship God. ~ Rejoice that God has saved you and created you to glorify Him. ~ And enjoy your walk/fellowship with God. My friends, you have been saved by grace through faith in Jesus Christ so shout it from the mountain tops that all the world may hear. God of grace, Your mercy and faithfulness endures through all generations. Your love extends throughout Your never ending creation. And when I contemplate this, Oh holy God, I am in awe of You and therefore I have this desire that all may come to know Your amazing love and grace through Jesus Christ. And so I lift up to You all those who do not call on the name of Jesus as their Lord and Savior; that they may come to saving faith in Jesus Christ. I’m not talking about a head knowledge about Jesus but an intimate knowing of the heart of Christ. May those who are reading this have their spirits stirred and transformed. May You open their eyes to see the truth of the Gospel. May they be joined to the death and resurrection of Jesus Christ our Lord and Savior. I also lift up to You those who are wavering in their faith. Maybe they are doubting the truth of the Gospel. Maybe they are drifting away from the church. Maybe some tragedy has turned them off from You. Whatever the case, oh God, may they remember Your love and come running back as the prodigal son found his father anxiously awaiting his return. And for those, oh God, who think they stand firm; those who feel that nothing can touch them, humble them. May they be reminded that complacency is one of Satan’s greatest weapons. Strengthen their faith. Faith is such an awesome gift from You through the Holy Spirit, so I ask that Your will may be done; that all those who call on the name of Jesus, may boldly go out and be Your instruments of salvation. May You be glorified in the faith of Your children. May God bless your day. May God give you opportunities to proclaim to people the saving love of God through Jesus Christ. And may God grant you the courage to not waste those golden opportunities. Holy God, I thank you that my eye lids opened to see this day you have made. I thank you that I am here in this world to glorify you. I thank you that you are using me to proclaim the Gospel of Jesus Christ. But I need help; we need help. There is so much filthiness around your children. So much impurity, sexual immorality, crudeness and foolishness. There is so much temptation and Satan is too strong for us. May this filthiness not be named among us and may we flee from its presence. May we run to you and may we seek refuge in your arms. Then, Oh God, lift us up that we may give you praise and speak of your goodness and holiness and grace and love. May we proclaim with boldness the death and resurrection of Jesus and the forgiveness of sins. May we be holy as you are Holy. Loving God, this task is too great for us and if it were left up to us then we would certainly bring it all to ruin. May you be glorified and praised and worshiped; through Jesus Christ our Lord I pray, Amen. May God bless your day as you strive for holiness and serve Him.